Here is my annual review of how my businesses and blog performed in 2018. This is a great way for me to review my entire year and discuss my goals, accomplishments and more. I have been writing an annual online income report since 2015, which is the year I started blogging. This will be my fourth annual online income report. I really like being able to track my yearly progress and am glad I have been documenting my journey since the beginning. Before we get started, grab this free guide on 7 Ways to Boost Your Blog Income Overnight to increase your income this year! When it comes to monthly income reports, I stopped publishing these reports earlier in the summer of 2018. However, I had always planned on writing an annual report documenting my entire year so I could wrap things up and feel complete with sharing my online journey. I have been on the fence about sharing my monthly income reports for well over a year and finally made the decision to stop publishing them online. While I have received many nice emails from readers that have been following my journey since the beginning and many people asking me to continue sharing them, I am at a nice point in my online journey and feel like this is a great stopping point. While my online income will continue to hopefully grow as my businesses and blog grow, I feel really great being able to share my journey over the past four years. First, I think it's important to state that income reports were an amazing way to grow my blog. They helped me stay accountable every month and track my income and expenses. Income reports have also helped me gain social proof, authority and validity. It's much easier to build trust when I can show the proof of what I preach. I've been tracking my income for the past four years, and many readers have been with me since the very beginning, even before this blog made any profit! With that being said, there are a few reasons why I decided to stop publishing reports. Writing a monthly income report is much more time consuming than writing other blog posts. There is so much information to verify with my income and expenses, and it often would take me an entire day to put my report together. I would also struggle with how much information to share in the report. Even though I would share my income and expenses, I would still receive a handful of emails or comments asking me to share even more information. As I am very private and already felt I was oversharing some of my personal information, I found that to be very odd. I totally get that I put myself out there with sharing my income reports, but some people were never satisfied and always wanted more! I'm also not sure how useful my reports are for other aspiring bloggers. After polling my email subscribers, the majority of my readers asked for more help as they were brand new bloggers. This means posts like my first income report proudly stating how I made $60 are much more relevant and relatable than sharing an income report where I made over $100,000 in one month. Another issue with writing income reports is dealing with the stress when my online life and real life crosses over and makes me feel uncomfortable. While I am really excited with all that I have accomplished and how many people that I have helped via my businesses, blog or with my courses and products, I don't want someone I have just met to check out my website and hone in on my income reports. I have an overwhelming sense of relief now that I am done publishing income reports, but super glad I stuck with it over the years! The great thing is, I have over four years of income reports available on my site that readers can review. I am always happy to talk about the ones that are published and how my journey progressed. Moving forward, it will be nice to keep that type of information to myself. I am not disappearing and have no plans to stop making money online! If you are new to this website, here's a brief summary of how I got started. I started my website around January 2015. It took me around four months to earn any income from my blog. In April 2015, I published my first income report and made around $60 online. It was the best feeling! I love this income report more than all my other income reports because if I was a brand new blogger today, it would still be just as relevant today as it was then. The first few months were exciting but also challenging! I was brand new to blogging and wasn't sure what I was doing. I spent my free time trying to learn from others about how to become better at all the things. When I started my blog, I paid for hosting and received a free domain. I initially used a free theme and had a free email. Hosting was my only expense for my first several months of blogging. Talk about a cheap, low cost way to start an online blog/business. Since I started blogging and reporting my income reports, my income has steadily grown from the previous years. I really enjoy being able to track year-to-year progress and see how much I have grown over the past few years. Looking back these four years, my blog and business produce income has changed so much. I've always been great at switching gears and pivoting if needed, and this helps keep me on my toes as well. At first, I started out as a blogger. But when I decided to get serious about blogging, I became a business owner! For example, most of my income in the early days came from freelancing, ads and sponsored post when I felt it was a good fit for my blog. Today it primarily comes from my own products and courses, affiliate income, ad revenue and some coaching and freelancing. I wrote this post sharing how I launched a profitable blog and what I did month-by-month. This post is worth the read because it answers one of the most common questions I get asked, which is how have I made money blogging since I started my blog. It includes about 18 months of blogging income and where all my income came from. You can find all of my income reports here if you would like to see every single monthly report from 2015 through July of 2018. This was all in my spare time while I was at my day job. I treated my blog like a business right around January and walked away from my day job in October of the same year. 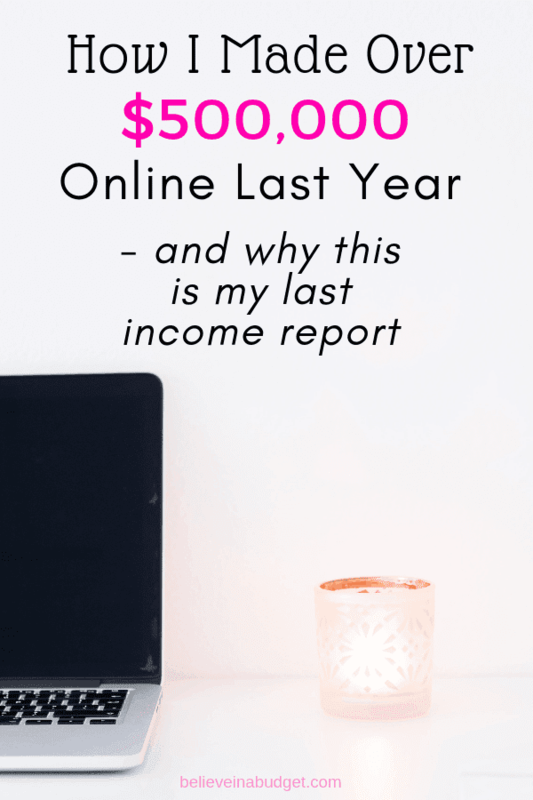 I had plenty of Pinterest virtual assistant clients, as well as blog income coming in, so I was confident leaving my job knowing that my income would grow. While I wasn't earning the same amount at my day job (I had a great salary at my day job but had essentially peaked with my earnings potential), I did have enough in savings to feel comfortable to leave my full time job. Fortunately, I never had to touch my savings. My income started increasing immediately after leaving my job because I has so much work lined up! The following year, I entered my first full year of blogging full time. This was one of the best years I ever experienced! I was free and able to grow my business and my blog, create my own schedule and do all the things I could never do having a 9 to 5 work schedule. That year I turned Believe In A Budget into an LLC and had the mindset of a business owner that included operating a blog. This allowed me to see the big picture! As a blogger, it's easy to have the mindset of writing blog posts and emailing readers. But there is so much more than that! As a business owner, I let myself dream bigger. I grew my Pinterest VA business into a full blown Pinterest management company. I worked with brands in person and online. And I continued to blog! In 2017, I made $289,462. This was over three times the income I made from the year before. There is no way I could ever have increased my income like this at my day job. It was amazing! I worked full time hours and hustled hard all year. By the end of the year, I was pretty tired and burnt out from working all the time. But my hard work paid off! My increased income was due to focusing more on my own products, having a stronger affiliate marketing plan and focusing on my joint course with my business partner and real life BFF. In 2018, my income was $511,986.82. It's amazing how much income can grow year-to-year, right? Last year I focused hard on establishing a work-life balance and it did wonders for me. I was able to grow my income by continuing to work smarter, not harder. I was focused and had some serious goals on my list. I realized that I was in a fortunate position to have a steady work list of things to do, and my businesses would be fine if I didn't work on weekends or on vacation. And guess what…everything was fine! I modified my work schedule to only work weekdays. I shut down the laptop most evenings and on weekends. I also enjoyed some mini vacations throughout the year. Of course, my schedule can change. Right now this is the best schedule to accommodate my home life. 🙂 If I needed to pivot and work only at night and on the weekends, I would do that too! I'm fortunate that I can be flexible. I actually felt more pressure on myself to work harder in the fall so I could take three weeks off around the holidays. The time off was fantastic and I came back to work in January feeling refreshed and ready to go! Of course, I don't get to keep all of this. I think it's important to recognize that there are business expenses and it would be unrealistic for me to have you think I get to keep 100% of what I make. Every business and blog has expenses. Technically, I own two businesses and have a shared business with my partner. My business partner and I split the profits from Pinterest VA right down the middle, and I've included the total as part of my income and expenses. After I pay myself, I still have a few additional expenses. If you are an employee, you normally don't have to worry about some of the items on the list below. Health insurance – I have a better plan being self-employed than I did at my day job! As you can see, this is a lot of information! Don't feel intimidated though. Remember, I'm on my fourth year of doing this. I never imagined I would be running multiple businesses when I first started! Believe In A Budget has a lean business model as I do a lot of the tasks myself. As I presently spend around forty hours per week on my business, I can handle a lot of tasks. My expenses were higher with my joint business than this blog. It's interesting having two business models that are totally different from one another, but each model works great and makes sense. For my blog, I don't outsource a lot of things and rely on automation like scheduling tools, zaps and funnels. With my joint business, we have a small but mighty team. Each person is amazing and by outsourcing some tasks, this allows us to spend more time with students. As things change in the future and when I decide to work less for personal reasons, it will be a smooth transition because of the systems I have set up and the right go-to people. During this past year, I dedicated time to specific parts of my business that I could review. This allowed me to see what I needed help with and what I could do myself. There are areas that don't have the best ROI (return on investment), so it made sense to outsource these tasks. Basically, if I can't do something in a timely manner, I ask for help! I would rather pay an expert for help so I can focus my energy elsewhere so I can make more revenue. After splitting some income and expenses 50/50 with my business partner, documenting my income and expenses from Believe In A Budget and calculating Harpeth Trading, I netted around 60% of my gross income. I launched this side hustle business at the end of August. This was something I had absolutely no experience with but a great opportunity to learn something new. Learning how to design products, work with manufacturers, and receiving prototypes were just some of the things I had to do for prep work. I also had to learn the whole Amazon platform, such as how to create product listings and Amazon ads. Needless to say, there have been ups and downs with this side hustle. I can't wait to see where this is a year from now! This was a brand new business venture and a way to expand my sources of revenue. My goal was and continues to be to have the most helpful Pinterest virtual assistant course available for students. There is no other course like ours out there and it's become well recognized in the online world by students and clients alike. My business partner and I had the course professionally filmed, which was a brand new experience for both of us. We regularly made updates to the course and provided additional services, like a membership group for Pinterest VA students. We provided a steady stream of client leads inside our community and have built a really strong reputation for students and clients. Gina and I kept regular weekly meetings and have in-person meet ups. Our hard work resulted in more that double the sales revenue from the previous year. After being in a number of Facebook groups and observing the interaction between course creator and students, I found that the more I interacted with students, the better their experience and their success. I made a point to dedicate daily time inside the group during the work week as much as possible. The last thing I want to do is make myself seem unreachable. Gina and I hosted regular bonus trainings, office hours, Facebook Lives, answered questions and more! I've always had a quiet confidence, but haven't always been comfortable enough to really market myself. I don't have time to hang out in Facebook groups all the time and offer up advice and give my two cents, and I'm not on Instagram or Twitter regularly. You can check out more of my media mentions and interviews here. I also was comfortable increasing my marketing budget because of how much income and email signups I was getting as a result of ad spend. This year I worked on Facebook ads directly with the creators of this course and had amazing results for Pinterest VA and Believe In A Budget. Last year I learned that if I spent too much time on one business, the other two suffered. Pinterest VA was a side hustle project that has exploded in growth! We had a couple of public launches, prepped year round and had our course professionally filmed and worked with students pretty much every day during the work week. As Pinterest VA took up more time, Believe In A Budget would temporarily get put on the back burner. Fortunately, BIAB is pretty self-sufficient and could afford some down time. Harpeth Trading is my new Amazon FBA business and that was a quiet, behind the scenes project I worked on in my spare time last year. It was pretty tedious as it took me months to go through the course and implement the material at the same time. Sometimes I asked myself ‘why are you doing this? ', but I'm pretty sure I said the same thing when I started my blog, ha! When working with companies overseas, most of my meetings took place anytime from 9pm – 3am, as they are half a day ahead of me. Trying to function late at night and make good business decisions feels like a total blur. Once I was finally able to launch the business on Amazon and on my own site, it was a big sigh of relief. I made it through the year, learned how to advertise and made sales! But, I still have a long way to go as there is still so much more to learn. I'm excited to see what happens with Harpeth this year. This year I've mapped out how to focus on all three businesses. While they don't necessarily need an equal amount of time to perform well, they do need individual dedication to grow! At the start of the year, I went though all three businesses to figure out what needed to be done for each business and how to allocate my time. I'm a big fan of using Google Calendar, my personal planner and my notebook. No matter where I go, I keep my planner and notebook with me, and have Google Calendar on my phone. I also have a vision board on my wall, use post-it notes on my wall and write everything out on these big sheets of paper. I'm a paper person and very visual, so I need to see my goals and work week mapped out. I debated sharing any type of personal update. I was a little more guarded and reserved last year and wasn't as active in the communities as I had been, whether it was online or with meetups. I'll be honest, 2018 was hard. A ton of my Pinterest pins got hijacked during the start of the year. I dealt with some bloggers that were copying my products and content and I couldn't understand why people were like that. Imitation is the sincerest form of flattery though, right? During all of this, my cat passed and my dog passed away. As we had been together since college, they were with me as I went through some pretty major adult life events, so it felt like the end of an era. I was still functioning and everything seemed normal on the outside, but for the remainder of the year I was pretty sad. On the plus side, this was the best work year ever! I connected better with my audience, and realized I'm ready to shake things up a bit. I had a lot of great interaction with readers on my blog and via email. I enjoy helping others when they really want help – not just an easy button! After polling my readers, I discovered that a lot of my readers want me to move towards more of a teaching role, which I found really interesting. Many asked for more help on blogging, tutorials, coaching, how to create things, how to monetize more, etc. I didn't anticipate those kinds of responses, which is why I'm glad I asked my readers what they wanted to learn more about this year. I have a lot of fun things planned for the year and some surprises, so it's going to be a great year! Another highlight were all my mini-vacations and time off work! We went to North Carolina, the Biltmore, the Smoky Mountains, Georgia and lots of weekend trips getting lost in the middle of nowhere. We went kayaking, hiking and spent a lot of time outdoors. I had a girls trip to Vegas and spent time down in Florida, and never would have been able to do all this travel with a day job. Being able to work from anywhere is such a great feeling and provides so much flexibility. I feel super grateful for another great year and there is so much more I want to do! What was one great thing you did last year? I totally understand why you want to end income reports, and I think we talked about it 🙂 But this is super inspiring! I need to 5x my business and your success is always motivating. Thanks girl! 🙂 Can you believe we’ve been blogging friends for 4 years now?! I’m definitely relieved to be done writing them, it was getting to be too stressful!! Congratulations for your achievements and for proving that it’s possible to materialize big dreams. It’s so inspiring to read such stories. Touche’-I said like to you to-that was good grammar. I should have proof read better. Thanks, fixed! If you are nervous about starting a blog, check out this post. You are amazing and such an example to many. I totally support your decision to not share income reports any more. I wish I had your drive and tenacity, as well as your tech savvy. I am on the fence about starting a blog. Please don’t think I am being “picky”, but you appear to be professional. There is a line where you mention that many people would like to you to take on the roll of being a teacher. It is role, not roll. (That’s the educator coming out in me.) I personally would like someone to inform me if I was using an incorrect spelling or use of a word in a post. Hope you don’t mind. I do Amazon FBA also! Can’t wait to hear about how you are doing with that business. I think it was very generous of you to share your income reports with us, it definitely inspired me to start my own blog. Keep up the great work and don’t feel bad about doing what you need to do for your own sanity!